The catch basin (storm sewer) openings we see on our streets don't lead to a treatment facility, they empty into our streams and lakes. 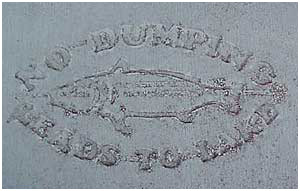 Local contractors are helping us to remember this by stamping newly poured concrete with the phrase "No Dumping, Leads to Lake". Older catch basins can also be marked. See our Volunteer Storm Drain Marking page to learn more! View "Liquid Assets Minnesota" a 56-minute documentary exploring concerns anout the state's aging water infrastructure produced by tpt's MN Channel and Central States Environmental Assoc. Take a tour of the City of Duluth's network of underground and overland water conveyance system - some of which demonstrates the remarkable craft of the era which could be quite beautiful. Hydrology is the study of water's properties, distribution and circulation on Earth. Take a moment to think about how we use and move water through the city of Duluth. Water is pumped from Lake Superior to the Lakewood Water Treatment Plant. It is cleaned and sent through the drinking water system to homes, businesses or storage tanks in Duluth. Depending on how we’ve used the water, it gets carried away by either the sanitary sewer system or the stormwater sewer system. Sanitary Sewer System: Dirty water that goes down our drains and toilets is called wastewater. Wastewater travels to the Western Lake Superior Sanitary District (WLSSD) through the sanitary sewer system. The wastewater treatment plant at WLSSD cleans the water before it is discharged back into the St. Louis River. Water released into the river must first meet strict regulatory standards for pollutants. Stormwater Sewer System: The stormwater sewer system is designed to collect rainwater and snowmelt. This system is operated and maintained by the City of Duluth. Most of the open grates you see on the streets lead to the stormwater sewer. 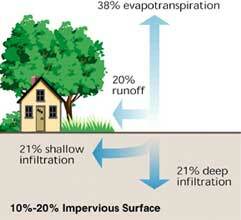 It also collects water and pollutants that run off of sidewalks, driveways, and lawns. Stormwater pipes drain directly into one of the city’s 43 named streams (all of which drain into Lake Superior). This water does not get treated, so all pollutants in the water are carried directly to steams and lakes. Between the sanitary and stormwater sewer systems, there is a lot happening below the streets of Duluth. The City of Duluth maintains more than 431 miles of underground storm sewer lines, 100 miles of roadway ditches and culverts, two lift stations, 13 sediment boxes, and 5,600 manholes. WLSSD has nearly 75 miles of sanitary sewer pipes, 16 pump stations and receives an average of 40 million gallons of wastewater per day. How is URBAN Hydrology different than natural hydrology? Development on the land changes how water naturally travels through the watershed. 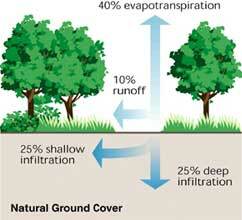 As mentioned above, with a natural ground cover about 50% of rainfall infiltrates into the ground, 40% evaporates or is transpired through plants (these together are called evapotranspiration), and only about 10% actually runs off the surface. As we develop the land, we add structures onto the surface, such as roads, houses, parkinglots, sidewalks, and driveways. 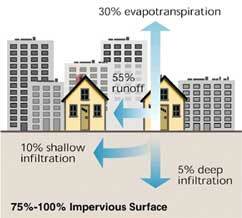 All of these are impervious surfaces: water cannot pass through them as it can through soil, and so instead of the water infiltrating, it is forced to either evaporate or run off. Considering that much of the evapotranspiration is due to plants, and the impervious surfaces we construct are not plant-friendly, this option is largely removed, and runoff increases. 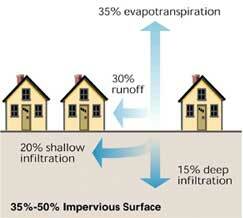 The amount of impervious surface within a watershed determines how great the change in runoff will be. At 10 to 20% impervious (similar to medium-density residential areas), runoff is doubled, and the amount of water infiltrating is reduced. At 30 to 50% impervious (such as in high-density residential developments), runoff is tripled, and at 75 to 100% impervious (as is common in commercial areas), the majority of rainfall becomes runoff, and infiltration is less than 1/3 of what it was prior to development. The results of increased runoff and reduced groundwater are two-fold. First, the large amount of extra runoff causes the streams to have much higher flows than natural, and the flow rate increases much more rapidly and drops off more rapidly after the storm. Second, due to the reduced infiltration volumes, there is less water available to be released slowly into the stream over time, resulting in lower water levels between rainfall events. In effect, much of the water that under natural conditions infiltrated into the ground and slowly made its way into nearby creeks now enters the stream all at once.